NantwichNews was set up in 2009 as a simple blog to provide anyone with an interest, involvement or attachment to this fabulous Cheshire market town with news, sport and what’s on information all under one online roof! 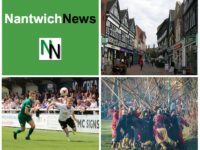 Welcome to Nantwich News – your one-stop shop to news, sport, what’s on, reviews, village news, and much more all about this fantastic Cheshire market town. Nantwich News is delighted to have a number of regular contributors who provide great news and sports stories, reviews and photographs on a regular basis. And we would love to expand this and give as many people in the community as possible a chance to contribute. This Acceptable Use Policy sets out the terms between you and us under which you may access our website www.thenantwichnews.co.uk. This Acceptable Use Policy applies to all users of, and visitors to, our site.